Kathleen Burns Kingsbury is a wealth psychology expert and founder of KBK Wealth Connection, and author of several books including How to Give Financial Advice to Women and How to Give Financial Advice to Couples, both published by McGraw-Hill. For more information, visit kbkwealthconnection.com. 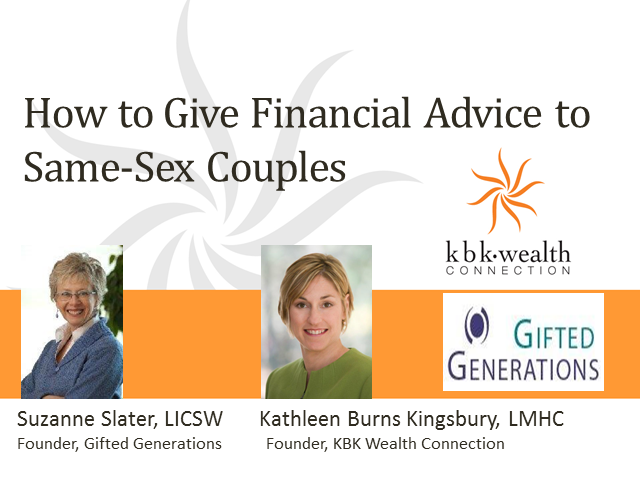 Suzanne Slater, LICSW, is a family wealth dynamics consultant, founder of Gifted Generations, and the author of The Lesbian Family Life Cycle. For more information, visit giftedgenerations.com. Traditional Marketing + Digital Marketing + Social Media Marketing = Fusion Marketing! If you are still calling yourself a “Social Media Expert” then you’re announcing to the world that you have been left behind. If you’re an expert in Facebook and Twitter, then you’re trying to build a entire marketing strategy restricted to using only one or two tools available. Facebook is not a strategy. Twitter is not a strategy. If you’re still stuck looking at social media as a stand alone marketing technology, then you’ve been left behind. The Fusion Marketing Bible is the next generation of marketing that brings our 6,000 years of traditional marketing, the exciting digital marketing tools of the Internet, and social media and fully integrates them into one seamless tool set that will accomplish every objective you set! The Fusion Marketing Bible isn’t just about integration; it’s a totally new concept of “Interconnecting” all of your traditional and digital tools together! The Fusion Marketing Bible is about looking at all of your tools, campaigns, objectives, and conversion strategies first in two-dimensions, then taking your entire marketing strategies into the world of three-dimensions. This allows you to look at everything you do in marketing in a completely different way. The Fusion Marketing Bible, now #3 on Amazon, comes from Lon Safko, the author of the internationally best selling book; The Social Media Bible, #1 on Amazon. Join Lon Safko and host Meridith Ellitott Powell as you learn to transform your marketing strategy in this high-energy and cutting-edge webinar! Today’s workplace is a complex environment that challenges ambitious women. The path to the top isn’t straightforward and it’s critical to understand the workplace dynamics in order to avoid potential barriers. • How to assess the power, the rules, and the culture of your organization in order to navigate successfully. • How to identify and plug into the power grid in your organization. • How to use self-promotion, strategic networking, and sponsorship to get ahead. "The Go-Giver tells the story of an ambitious young man named Joe who yearns for success. Joe is a true go-getter, though sometimes he feels as if the harder and faster he works, the further away his goals seem to be. Rapidly going from national bestseller to global phenomenon, The Go-Giver soon gained a devoted following in its original English and in more than 21 foreign-language editions. From schools, churches and hospitals to law firms and information technology companies, individuals and groups around the world have applied the book’s Five Laws of Stratospheric Success to their organizations and businesses, relationships and personal lives." Join Meridith Elliott Powell as she interviews Bob Burg, Speaker and co-author of the International Best Seller, The Go-Giver. This webinar is full of information you will use every single day as you move forward with your business! Learn to shift the way you relate and even the way you view your business to increase value, build trust, and gain profits. This is one webinar you will NOT want to miss. Time to Rediscover a Healthy You! To increase your bottom line, you need to make sure your health and wellness are at optimal performance! Join Host Meridith Elliott Powell as she interviews author, speaker, and health coach Polly Pitchford. Polly's radical approach to fitness will transform your lifestyle as you navigate the corporate world! Get the secrets that will increase your optimal performance, any day of the week! Let's talk business performance improvement! The way we do business and the way we approach sales and sales training has changed. And with this new approach, we introduce the Resource Manager: one of the most pivotal tools to any great business. Meridith Elliott Powell hosts guest Jack Hubbard, widely known as the "Professor of Prospecting." Author, facilitator, and out-of-the-box thinker, Jack brings his expertise to this high-energy, humorous, and hard-hitting webinar to deliver tools EVERY professional needs to improve their business! Leadership today demands that we understand each other's differences first, in order for us to be understood. During this webinar, Kathleen Burns Kingsbury interviews Lauran Star, global speaker, consultant and author of the new book "Your Power Pivot" on this topic. They'll discuss how to shift our perspective about leadership, how leadership training programs fail, and how communication is the pivot point to success. Ann Hughes, speaker, author, consultant and founder of The Female Affect, shares her professional experiences from the boardroom and her personal experiences of motherhood to provide helpful advice for women who strive to have it all. She helps to guide women to find the opportunities, balance and confidence to grow in their careers, while creating a well-rounded home life, whatever your version of having it all looks like. Organizations that create a “coaching culture” have stronger teams, more inspired employees and more collaboration. Wendy Hanson has worked with executives and teams around the country in the technology sector, hospitality, manufacturing and a number of financial planning firms and accounting firms. Learn some of the attributes of a healthy coaching culture and be part of the discussion of how to move your organization’s culture towards individual and business success. With more than 25 years experience and a passion for helping people realize their full potential, Wendy Hanson has achieved great success as an Executive Coach, Team Builder, Author, Speaker, and Radio and Cable TV Talk Show Host. Now she brings her savvy insight to The Client Connection, and will help you create a coaching culture in your organization to increase passion, ignite initiative and blow past your goals! Tune in to discover how your health impacts your business growth. Heidi Hanna, New York Times bestselling author of "The SHARP Solution: A Brain-Based Approach for Optimal Performance" and the follow-up release "Stressaholic: 5 Steps to Transform Your Relationship With Stress," teaches you how focusing on having enough energy vs having enough time is the key to success. Join this dynamic duo on The Client Connection! Yuhannes Watts is interviewed by Meridith Elliott Powell on becoming the go-to person in your field. Creating business is about connections and in this can't-miss webinar, you will learn the tools you need to increase your sales pipeline, get a greater ROI and fuel your profits. Grow your business by strengthening your brand! Creating a succession plan is a challenge for any business owner, but if the business is a family business, the issues involved can be significantly compounded by emotional considerations. Listen in while Denise P. Federer, Ph.D., consultant, business coach and behavioral psychologist, addresses some of the significant issues to consider regarding a succession plan, to ensure that owners safeguard the personal and financial future for their clients, employees and family members. Speaker, Author, CFP® Debra Morrison lends hidden tips that are extremely helpful to financial services professionals who wish to attract more clients. Debra identifies procedures that are proven trust builders, and illustrates communication tips and styles, especially in working with women clients. She references many experts’ research in behavioral finance such that you can further research any number of her sources to delve more deeply into how to build a psychological bridge to women—whether the women are savvy investors or just learning about investments. “Your practice will surely be richer by your adopting these principles, and I hope you'll enjoy my humor throughout!" The #1 Reason that stops people from getting what they truly want is lack of accountability. People who are held accountable to do the work required and prosper! How to develop the self-discipline to do what you know needs to be done when it needs to be done so you get the results, professionally and personally, you are truly capable of. No Excuses Accountability. During this what-to-do and how-to-do-it webinar Anne Bachrach will share lessons from coaching Advisors who make middle six-figure to seven-figure incomes. Most Financial Advisors know what to do, yet they don’t do what they know they need to do so they can achieve their goals and enjoy the kind of business and life they truly want. Don’t leave your potential underdeveloped. Maximize your capabilities and make 2015 your best year ever. You've made it this far, now what? Building a successful career in the financial services industry used to be straightforward as everybody looked and acted the same. Join Kathleen Burns Kingsbury and Colleen Denzler, former Senior Vice President and Global Head of Fixed Income Strategy at Janus Capital Management, as they discuss another way. Colleen will show you that the path of individuality, both around what success looks like and how you can get there, is the best way to reach your financial and professional goals. As social media blurs the line between personal and work-related communication, sales professionals are seizing the opportunity to create meaningful relationships with customers. With over 200 million users, LinkedIn is a rich source of sales leads. But how do you access them? Learn directly from Social Media Expert, Amy McIlwain, how to implement a scalable social media strategy for your sales force, and get results. How profitable is your sales model? Do you know your market niche? In this webinar, guest Marissa Levin is sharing her secrets to help your business reach its greatest levels of personal and organizational potential. Kathleen Burns Kingsbury and Eleanor Blayney, Consumer Advocate for CFP Board, discuss the female financial advisor famine and how to attract and retain women advisors. Join Kathleen Burns Kingsbury and Meridith Elliott Powell, two experts helping financial services professionals take their businesses to the next level, in this innovative webinar series. Learn practical tips and strategies for providing high-quality client engagements that translate into more business, increased profitability and improved career satisfaction.